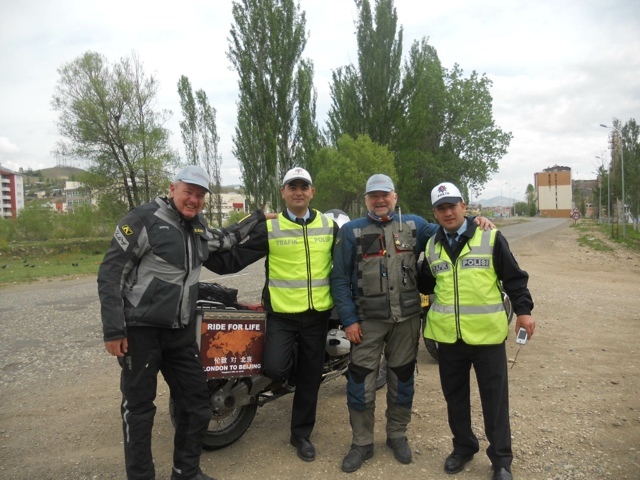 Our last full day in Turkey was a short hop to Kars ready for a quick drive to the Georgian border tomorrow. It was meant to be a blast down the motorway to give us time to visit the ruins of the ancient town of Ani in the afternoon. Deefor rode out with Mel and we decided to take a back road to Kars that looked a bit more interesting. What a road! Fantastic curves through mountain passes. Past small farming communities and sunny meadows. We arrived in the town of Oltu and got pulled over by the Trafic Polis (which is Turkish for Traffic Police apparently). The very nice young officers were much more interested in the bikes and our adventure than in booking us so we said goodbye and rode on. As we left the town we were pulled over again. This time the story of the Silk Road cut no ice and Deefor got a speeding ticket. The road climbed further into high Alpine pastures above 2300m and then down into Kars. We arrived just in time to join Sam and Steve L on a run out to Ani. Though a GPS assisted detour meant a 30 minute ride became an hour of dirt road fun. Ani was founded in the 5th Century AD as an Armenian city state. It was known as the city of 1001 churches but was captured by the Seljuk Turks in 1064. Built on a tongue of land between deep river canyons, the third side is sealed by a massive wall. It was a major city on the Silk Road, housing up to 200,000 people and rivalling Baghdad and Damascus. Now it is a lonely ruin. Abandoned and vandalised during the conflicts between Turkey and Armenia on whose border it lies. Did the enthusiastic pointing at your pannier map and at your turkish sticker not discourage them from issuing you with a speeding ticket?